Honor Roll Member – Steichen, Robert Eugene « Perry High School Alumni Association, Inc.
Robert Eugene Steichen was born eight miles north of Perry on the family farm “Sunny Slope”. He is the third son of John & Maude (Schiltz) Steichen, born after John and Joe Steichen, and followed by a younger sister, Mary Lou (Klein). Both of his parents were teachers prior to becoming full time farmers. He walked to Sunny Slope School for his eight years of elementary education and remembers being punished regularly by the teacher: Bob had short legs and his feet didn’t reach the floor of his big desk, so his feet made noise kicking the desk. He spent times with his nose pressed to a circle the teacher drew on the chalk board for this offense. He graduated from Perry High School in 1944, riding the bus to school each day. He was active in the Perry High School Band, playing trombone in marching and concert band and serving as Band President his Senior Year. He was also a member of the National Honor Society. As a 4-H Club member, he showed sheep and pigs and fondly remembers his calf, Chunky, whose arthritic knees required constant attention. Bob boarded his first train to attend the National 4-H Congress in Chicago. He and his sister Mary Lou performed frequently around Perry, playing trombone and piano duets of popular music. The family were members of St. Rose of Lima Catholic Church, where Mary Lou played the organ and Bob sang in the choir. Following in the footsteps of his two older brothers, Bob attended Oklahoma A&M College in Stillwater. He hitchhiked home to Perry every weekend to milk cows and tend to other chores on the family farm. After one semester at A&M, he was drafted into the Army Air Corps, spending the majority of his service at the Air Base in Sacramento, CA. After completing two years of military service, Bob returned to Stillwater to complete his Bachelor of Music Education degree in 1950. At A&M he lived on campus and played in the trombone section of the band, earning 35 cents an hour setting up chairs and stands for rehearsals. He made lifelong friends in the band and band fraternity, Phi Theta Kappa. Bob accepted his first teaching position in Minco where he taught Band and Music for three years. Bob met Margaret Beadle at a 4-H party at Sunny Slope farm while they were both in high school. While Bob was teaching in Minco, Margaret pursued a career at the Equitable Life Assurance office in Oklahoma City, and the couple dated long distance. They married in Oklahoma City at Saint Joseph Catholic Cathedral in August, 1952, and will celebrate their 65th Anniversary this year. Bob’s career took the young couple to Waynoka where he taught Band and Vocal music for five years, then to Tonkawa, where he served as Guidance Counselor and Band Director at Tonkawa High School for 11 years. 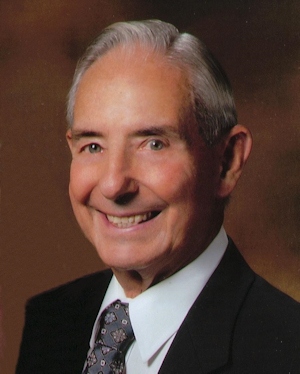 He completed his Master of Science in Secondary Administration from Oklahoma State in 1954 and his Education Specialist Degree in Counseling and Guidance from Arizona State University in 1967. Bob moved from Tonkawa High School to Northern Oklahoma College, where he served as Director of Counseling and Instructor in Music and Psychology for 21 years. He retired in 1991. Always an active member of the community, Bob served as President of the Tonkawa Chamber of Commerce and the Tonkawa Lions Club. He is a Past Commander of the Tonkawa American Legion and served on the Tonkawa City Council for eight years. He was a Committee Chairman of the Boy Scouts of America for 10 years, and is Past President of the Oklahoma Educators Association – Northern District. He continues to serve his community: heading the Tonkawa Leadership Program for the past 18 years, teaching “Character Counts” to 8th grade students at Tonkawa Mid-Hi School for the past four years, and serving as treasurer of the Blackwell-Tonkawa Airport Board, a position he has held for 25 years. Bob also continues to garden and farm. He and Margaret are active parishioners of Saint Joseph Catholic Church in Tonkawa, where Bob taught Sunday school for ten years and served on the Church Board for 24 years. They remain very involved in the lives of their six successful children: Jeanne (Friesen), pharmacist in Enid; Kevin, family physician in Tulsa; Suzanne (McQuade) physical therapist in Yukon; Brenda (Dobbs) pharmacist living in Tulsa; Jerry, musician based in New York City; and Barry, COO of the Saint Francis Health System in Tulsa. They have 14 grandchildren and six great grandchildren. Bob has been recognized with the Lifetime Service Award of the Tonkawa Chamber of Commerce (1999); Very Important Member of the Oklahoma Retired Teachers Association (2006); and, along with wife Margaret, the Tonkawa Pride Award given by the Tonkawa Chamber of Commerce (2016).